It must be difficult for Tony Abbott’s loyal MPs to defend him in matters like public transport, where he refuses to fund it, while heavily funding motorways. @PTNotTraffic @SHendersonMP Yep. Also be nice to see Federal MPs talking about PT and prepared to fund it, which they won't under Abbott. The only problem with Ms Henderson’s claim is that the Federal funding came some four years before Mr Abbott became prime minister. Being 2009, that was Kevin Rudd’s Labor Federal Government. Essentially, RRL got funding from the Feds (and the state) because it ticked multiple boxes: boosting rail capacity, urban development in Melbourne’s outer west, and as economic stimulus to help fight the GFC. The project had undergone several years of early planning previous to that, and while it had a haphazard start, the project was able to get underway pretty quickly. The first rail closures for major works occurred in mid-2011. Mr Abbott wasn’t PM until September 2013. Happily for the RRL project, by then the work had been underway for some years — and he couldn’t claw back the money. But he did pull money out of numerous other public transport projects in Melbourne, Brisbane, Perth and elsewhere. Note that under Abbott there hasn’t been zero funding for public transport. Indirectly, Canberra’s light rail has got funding via the Federal Coalition’s asset recycling policy. The Gold Coast light rail extension may get funding as part of Commonwealth Games preparations. Any others? I’m not sure. Ms Henderson may disagree, but given Abbott’s strong anti-PT stance, I sincerely doubt Regional Rail Link would have got any Federal funding at all under his government. To claim Abbott actually funded it is a distortion of the truth. Happily, Abbott’s stance doesn’t seem to be shared by his colleagues. Malcolm Turnbull is well known for his support for public transport, and Warren Truss seems to have been supportive of the metro rail tunnel. So even if the Coalition stays in power, things may change for the better, as long as it’s not Abbott who’s still in charge. 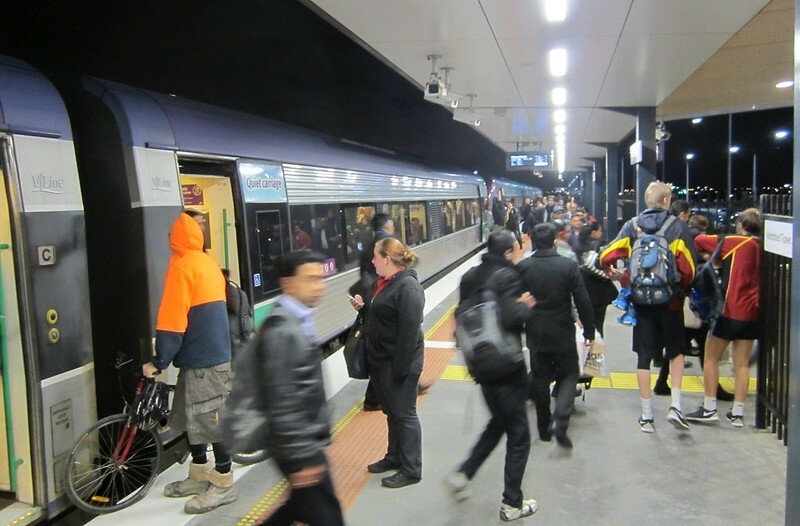 Crikey 26/8/2015: … While Henderson was right that the government was honouring a previous commitment, it’s not like it enjoyed it — Abbott has long said he is against federal funding for public transport infrastructure. … So they won’t commit any money to rail projects, but will take the credit when they hand over the money of someone else’s promise. ← Previous Previous post: What if the train lines were given letters? Hopefully the Member for Corangamite will be booted out in the next election. What a cheek! I read today’s Twitter contretemps with interest. I was surprised Ms Henderson chipped in from an indefensible position as being part of a federal government that is so anti public transport. For goodness sake you committed Liberal voting car drivers who will never demean yourself by using public transport, the more of the great unwashed who do use public transport means a faster car trip for you. But class divide is pointless. As it is in many countries, everyone no matter what their politics, uses public transport. There will be a breaking point, once The Abbott can no longer get to his favourite 3AW and 2GB radio stations in a timely manner because he is stuck in traffic. When projects span multiple years, multiple terms, and multiple persuasions of government, there will be some room for ambiguity about “who funded” a project. Was it the government that originally approved the project and included an allocation in the forward estimates? Was it the government that started the project – turned the first sod with the silver shovel? Was it the government that continued to fund the project, even though they didn’t start it? Was it the lucky government in power that cut the red ribbon when the project was finally completed? What about budget intended for one project by one government, that got diverted to another project when the government changed – who “funded” what in that circumstance? I’d rather our elected representatives drop this “funded by” nonsense – it’s backward looking, self-serving and tiresome. It does neither us, nor them, any favours. 3. recognise that travel is facilitated by a network of dependent and interconnected elements, not standalone projects. 4. recognises the full cost of travel – to the individual, to society, to governments, to providers, to the environment – and balances that against the benefit, when deciding the order in which to provide travel solutions. 5. demonstrates consistent long term vision, but is flexible enough to acknowledge present day possibilities. Pollies – stop bickering about who paid for yesterday’s projects, and get on with the challenges of today and the future. They’re clutching a straws mate. Keep them honest and keep up the good work! The money didn’t come from the Labor Pardy and it didn’t come from the Liberal Party either. It came from the taxpayers. It’s behaviour like this from politicians which strongly supports the argument for a totally independent body, which is mode / technology agnostic, tasked with the responsibility to oversee all aspects of multi decade strategic planning through to funding and execution of major national and state infrastructure projects. This body’s agenda and mission statement should be enacted in parliament, along with a commitment for a fixed annual revenue stream (or floating based on a transparent formula, eg % of certain taxes collected). This body then weighs and compares all projects and determines the optimum funding mix from its committed revenues, which they should have at least a medium term visibility of. Importantly, without intervention from political parties and interest groups. Infrastructure Australia, and Infrastructure Victoria might be good starting points, through expansion of their current advisory board roles.